If we consider different Western musical traditions, such as classical, rock, and jazz, we can find the same kinds of entities employed in all three traditions. For instance, there are recognizable, reinstantiable songs in all three traditions. There are also events we would happily call live performances of those songs, as well as recordings of them. Yet it is also true that these kinds of entities are treated differently in each of these traditions. For instance, those who produce and listen to rock recordings take, for the most part, a very different attitude toward what counts as acceptable use of recording technology (for example, note correction) than those who produce and listen to classical recordings. Are classical and rock recordings thereby different kinds of things? There is no absolute answer to this question. In some contexts, it is unproblematic to refer to recordings in general, ignoring the differences between these two types. In other contexts, however, it may be confusing or even misleading to ignore such differences. One such context might be where we are trying to understand with some precision the experiences of those who listen with understanding to, say, jazz recordings. 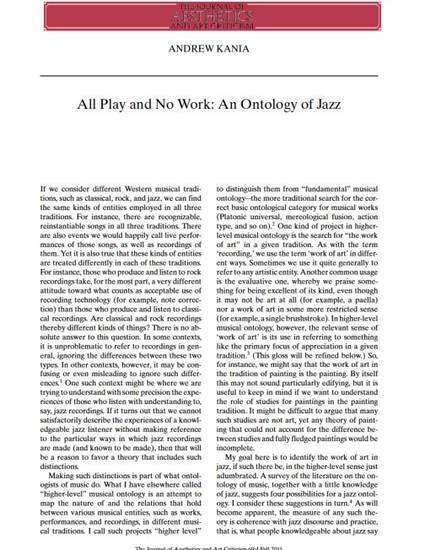 If it turns out that we cannot satisfactorily describe the experiences of a knowledgeable jazz listener without making reference to the particular ways in which jazz recordings are made (and known to be made), then that will be a reason to favor a theory that includes such distinctions.